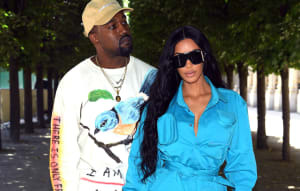 Kanye West released a special Easter track called "Ultralight Prayer" on Sunday and just after midnight, Kanye dropped another small gift to fans—the first release of a The Life Of Pablo track outside of TIDAL. "Famous," which also features Rihanna, appeared on Apple Music and Spotify on late Sunday night. No word on whether this means Kanye is finally done tweaking his project, or if the whole album will be getting a release on platforms other than TIDAL. Representatives for Apple Music and Kanye West did not immediately return a request for comment. Update, 3/30/2016, 9:55 p.m.: "I Love Kanye" is now available on Spotify and Apple Music. Today Kanye made another track from The Life Of Pablo available to listeners who don't subscribe to TIDAL. Listen to "I Love Kanye" below.